- failure of the upload part way through. I believe these problems are Flash related as VPhot is using a Flash tool for upload. With more information I will be better able to sort out the problem. I had the same observation: Flash Player disabled. However, when I looked in chrome settings it indicated that Flash Player was enabled. That didn't make much sense!? I decided to update Chrome to the current version even though I thought it did that automatically? A new version was installed. When I went back to the Flash Check site, it showed the following. I am currently able to select multiple images for upload with shift click BUT only the first image in the group gets uploaded and even then the upload window indicated that the first image was not completely uploaded. That is it showed only partial upload in the bar and stuck. I clicked cancel to close the window. When I went to my image list, the first image was present! So, things are a bit bonkers with the flash tool in vphot??! Or is space on the ftp drive limited? Edit 1: Ask first is turned off. In Chrome, look at the Flash settings by going to URL chrome://settings/content/flash. If you see Allow sites to run Flash AND Ask First both turned on, please try turning Ask First off and see if VPhot behaves better. I'm not sure of the security implications of turning Ask First off, so you probably want to turn it back on. I uploaded latest Shoickwave Flash 27.0.0.130 but still have problems with Upload Wizard. Upload of .fit file fails. 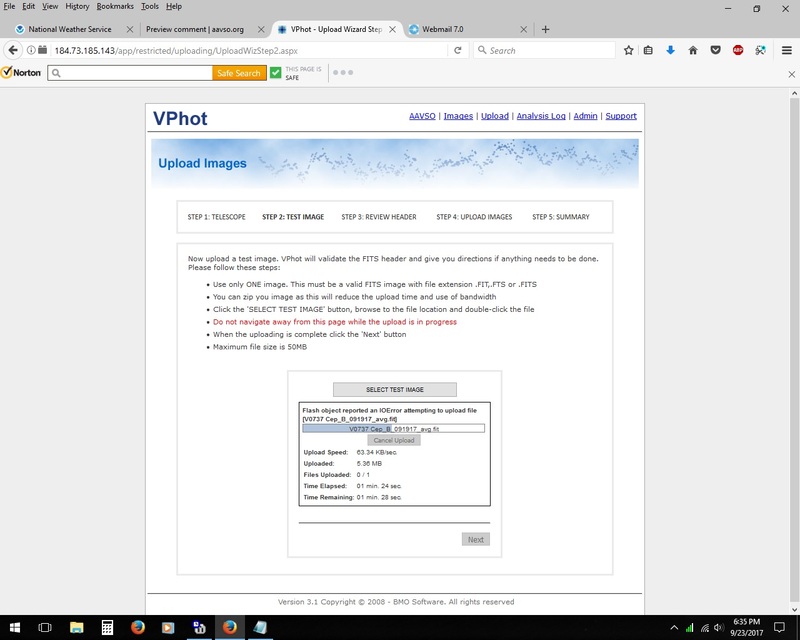 Also, VPHOT does not load or is very slow to load. I experience the same problems also when using the Simple option instead for Flash. The files load fast for the first 90% and then hung for several minutes before they finnish or sometimes fail. I discovered that uploads seem to recover if I logout of AAVSO, logging out and logging back in has seemed to help. No idea why. Time of day and day of week also seem to be implicated.